Saint Mark the Evangelist - My Catholic Life! John’s Gospel offers the reader this brief post-Resurrection scene: “Simon Peter said to them, ‘I am going fishing.’ They said to him, ‘We will go with you.’ They went out and got into the boat…” (Jn 21:3). The flock followed where Peter led. How easily Saint Peter moves to the fore in the Acts of the Apostles. How effortlessly he speaks for the entire Community of Faith. Saint Peter even leaves the running of the Church in Jerusalem to Saint James to show that he is not bound to one city or community. Instead, Peter walks toward the widest horizon of evangelization, the capital of the world—Rome. Traitor Peter becomes Pope Peter. Peter was, of course, a simple fisherman. It is more interesting to note that he did not remain a simple fisherman. He grew. He matured. He led. And leaders don’t have followers as much as joiners. Saint Mark, whom we commemorate today, was one of the most significant of the many joiners who uprooted themselves to join Peter in his dangerous adventure of founding the Church. Nothing is known for certain of Mark’s origins or his youth. He is not mentioned in the Gospel that bears his name and only the faintest biographical sketch is possible. What is known is that Mark left his homeland in Palestine to follow first Saint Paul, and later, Saint Peter. Mark sailed dangerous seas in primitive boats. He walked long stretches through desolate lands. He tried to convince hardened pagans and skeptical Romans that the Gospel message was true. The words of the Acts of the Apostles, the letters of Saint Paul, and the First Letter of Saint Peter all put dots on the large map of Mark’s life. Many blank spaces, however, still lay in between. Mark is traveling with Paul in Asia Minor, then he’s with Barnabas on a boat over here, then he’s with someone else over there, and then he disappears for a number of years. The scattered evidence ends, however, with clear testimony that Mark joined Peter in Rome. In Peter’s first letter, written from the city of his death to the Church in Asia Minor, Pope Peter sends greetings on Mark’s behalf and refers to him as “my son”(1 Peter 5:13). Peter was there when it happened. Peter heard the Lord speak. And Peter was getting old, or was in prison, or was threatened with death. The Gospel he had shared and repeated verbally so many thousands of times had to be written down to send to others, to preserve the accuracy of the story, or to contradict counterfeit versions. And so the natural progression from oral to written history slowly occurred. The Gospel was a spoken word before it was a book, and the word has primacy over the book. 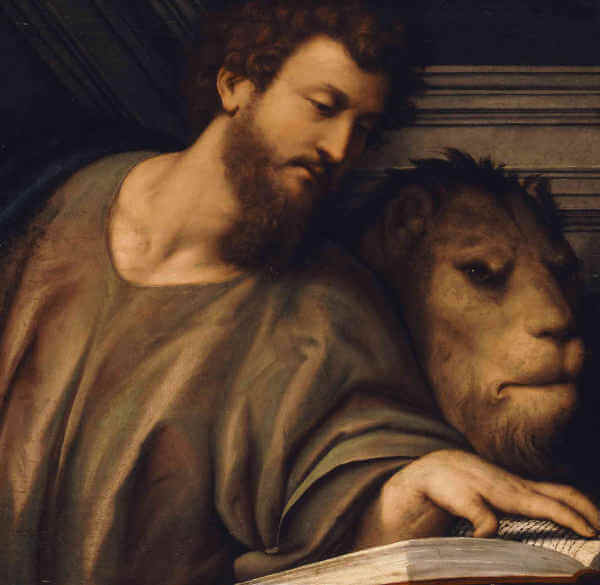 Saint Mark the Evangelist preserved for all time the Word of God, Jesus Christ, by committing Peter’s words to writing, thus ensuring that the spoken, eye-witness accounts of Christ’s life did not just float away in the breeze. Once the Word was enshrined on papyrus, Saint Mark had accomplished his mission forever and always. 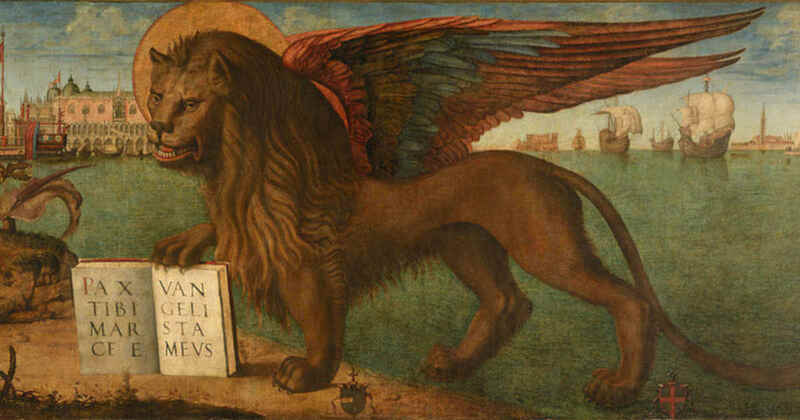 Saint Mark, you were a friend of the Apostles and shared their commitment to spreading the faith. From your home in Heaven, may you strengthen all those who lack the courage to live the Gospel message in their own lives so they can witness it to others.